Story added: 27 Oct 2004 13:02. Last updated: 17 Nov 2004 15:36. Apple has unveiled an iPod with a photo display function aimed at maintaining the company's lead in the market for digital music players. 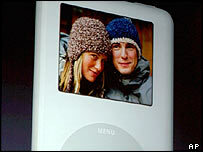 The new iPod comes in two versions, including a 60-gigabyte model capable of storing 25,000 colour photographs, which retails at $599 (? ?335) in the US. The device is intended to meet demand for convenient ways of storing pictures in the age of digital photography. "We think music plus photos is the next big thing," said Apple boss Steve Jobs. The iPod has become a must-have accessory since it was first introduced in October 2001, transforming Apple's financial performance. Apple saw its fourth-quarter profits jump 50%, largely because of the sale of two million iPods in that quarter. The company has sold more than six million of the devices altogether, giving it a commanding 50% share of the global market for digital music players. The new product is more expensive than existing models but analysts expect it will lift sales during the Christmas season. However, Apple is now facing stiff competition from Sony and Dell, which are marketing rival digital music players. And specialist firms such as Archos, Creative and iRiver have already produced hand-held devices which can store and display photos and videos as well as record music. Apple simultaneously launched a 'digital box set' compiling all of the albums by top-selling Irish rock band U2, which fans will be able to download for $149 from the company's online iTunes music store next month. It is the first time that the complete works of a music artist have been available in a single digital package. Analysts said the move blazes a trail in the online music industry, with other artists and digital music sellers expected to follow suit. To promote the U2 box set, Apple is also issuing a special edition iPod, which comes in black with a bright red click wheel, and bears copies of the four band members' signatures. Click here for all the best MP3 players including Apple, Creative and iRiver with free delivery.